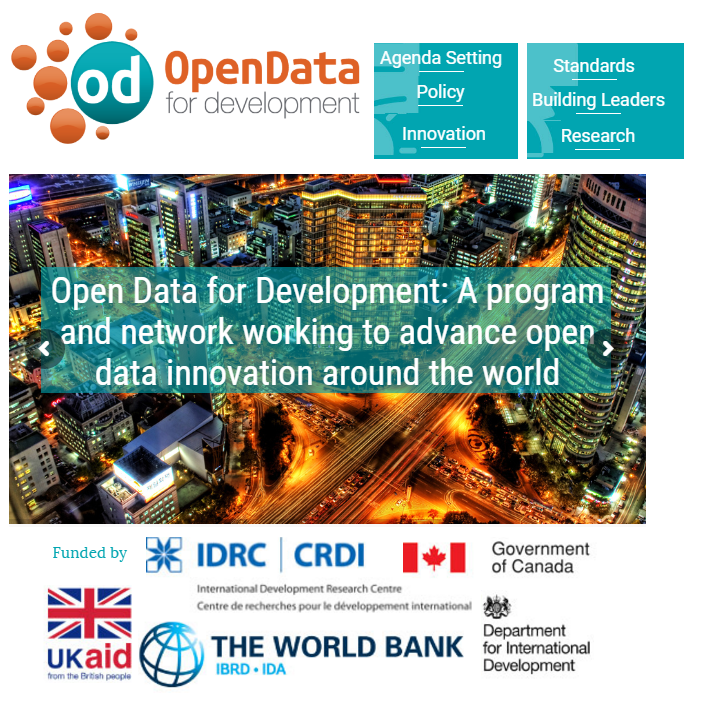 Open Data for Development (OD4D) is a global network of leaders in the Open Data community, working together to develop open data solutions around the world. OD4D network in conjunction with the International Open Data Charter (ODC), the GODAN initiative, and the Open Data Institute (ODI) are developing a domain specific open data implementation guide for the agriculture sector. “Open Data offers an important opportunity to support development goals and spur new social innovation ... The OD4D program objectives for 2015-2016 are: (1) To help developing country governments, entrepreneurs, and civil society create and implement national and global action plans to harness open data for development;(2) To support developing country governments to plan, execute, and manage national open data initiatives;(3) To increase re-use of open data in developing countries by supporting appropriate data standards, guidelines, solution-driven applications, and demand-side capacity, helping to bring about social and economic innovation; (4) To better understand the relationship between open data initiatives and socioeconomic development, informing the quality and reach of future open data initiatives … The Open Data for Development network is already global network which includes important players in the open data community such as The Open Data Institute, Open Knowledge, and the World Wide Web Foundation, the Latin American Open Data Initiative and Caribbean Open Institute, as well as collaboration with the Open Data Working Group of the Open Government Partnership” (Blog IODC 2015). was launched in 2010 to develop open data solutions and enhance the voice of developing countries around the world through building and maintaining a global agenda for open data (OD); (view: Open Data for Development Timeline). Since 2015 OD4D has been included in the Global Partnership on Sustainable Development Data. In the same year OD4D hosted the 3rd International Open Data Conference, launched both an International Open Data Roadmap and a regional forum - Open Data Charter. In 2014, a major two-year research programme entitled ‘Harnessing Open Data to Achieve Development Results in Asia and Africa’ was launched, to ensure OD initiatives that could lead to true development benefits in the Global South (the programme was launched under the umbrella of the OD4D, coordination of the World Wide Web Foundation, and with funding from the International Development Research Centre (IDRC, Canada)). OD4D is hosted through the IDRC, and organizes work through the guidance of a Donors Committee and the consultation of a group of dedicated implementing partners who are experts in OD issues around the world. OD4D’s partners organize key regional forums on OD like CONDATOS, the African Open Data Conference, the Caribbean Open Data Conference. Regional priorities identified during all events supported by OD4D provide the key building blocks for a collaborative and inclusive global OD4D programme/agenda. Through enabling better decision making, transparency and innovation, OD can play an integral role in achieving of the United Nation’s Sustainable Development Goal of global food security. That’s why the OD4D network together with the International Open Data Charter (ODC), the Global Open Data for Agriculture and Nutrition (GODAN) and the Open Data Institute (ODI) are developing a domain specific open data implementation guide for the agriculture sector. As part of realizing this goal, ODC has started the initiative of creating open data sector packages, each package developed by data users and publishers and tailored to the needs of the sector. Scalability – the first version of this resource only contains a small number of datasets within a clear scope rather than trying to address the agricultural sector in all its dimensions. First consultation feedback on the 'Open Data for Agriculture' Charter Sector Package’ will be incorporated and discussed during a stakeholders’ workshop at the upcoming GODAN Summit being held on 15–16 September 2016 in New York. Furthermore, a discussion on data standards in relation to the agricultural key datasets and categories will take place at the IODC conference on 6–7 October 2016 in Madrid. IODC16 will be designed not as a single statement on OD, but rather as a curated record of discussions and debates, providing a snapshot of key issues and setting out a path forward based on the visions, ideas, and agreements explored at IODC 2015 and collected in this report: ‘Enabling the Data Revolution’. After the launch the Agriculture Sector Package will be kept up-to-date by OD4D, GODAN and ODI. For engagement in the development of the Open Data Charter Sector Package please see the Agriculture Sector Package Working Group. On the 7th October, 2016, during the IODC conference 2016 in Madrid, a new 3.5 year project GODIVAN (Global Open Data for Impact and capacity Development in Agriculture and Nutrition) will be presented. This project is led by international partners with a strong agriculture, nutrition, data and ICT record including Wageningen UR –Alterra, AgroKnow, the Food and Agriculture Organization of the United Nations (FAO), the Global Forum on Agricultural Research (GFAR), the Land Portal, the Technical Centre for Agriculture and Rural Cooperation (CTA), the Open Data Institute (ODI), AidData, the Institute of Development Studies (IDS). By building (through training programmes) the capacity of stakeholders for OD users to both understand the potential of OD for agriculture and nutrition and to engage with it practically, the project aims to enable an effective use of OD in tackling the food security and nutrition challenges. Open Data for Development. Building An Inclusive Data Revolution (OD4D annual report, 2015).